In 1993 William Mesa made his directorial debut with the SciFi thriller TERMINAL FORCE. To create the effects work for the film, Mesa drew upon his relationships with many experienced creative and talented special effects artists and innovators to form FLASH FILM WORKS. Work on "TERMINAL FORCE" incorporated a wide array of visual effects techniques including miniature models, 3D animation, digital matte paintings, composting and pyrotechnics. 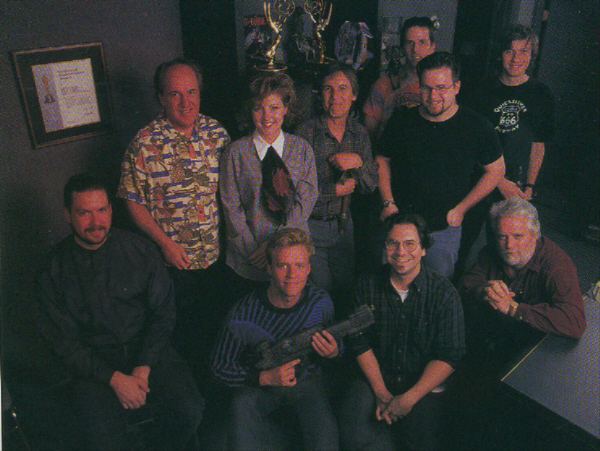 During pre-production of TERMINAL FORCE, the company produced the visual effects for WES CRAVEN'S NEW NIGHTMARE. While creating over 100 shots for this film, FLASH FILM WORKS was then hired by 20th Century Fox to do the visual effects work on the Charlie Sheen action film THE CHASE. FLASH FILM WORKS was next called upon by Universal Studios to handle all visual effects responsibilities in the Tony Dow produced remake of IT CAME FROM OUTER SPACE. The film's effects sequences include 3D transitional morphs, digital matte paintings, and 3D creature and spaceship animations. The company also worked on the CD ROM game MAXIMUM SURGE, the feature film THE DEMOLITIONIST and the Renny Harlin swashbuckler CUTTHROAT ISLAND during this time. Next, FLASH FILM WORKS created the effects work for William Mesa's next feature film DNA. Under the guidance of Visual Effects Supervisor John Mesa, the company produced realistic 3D creature animations and detailed CGI depiction's of Blackhawk and Apache helicopters, as well as over one hundred other effects shots. After the completion of work on Mesa's film, Flash began working on the Warner Brothers motion picture BATMAN AND ROBIN, creating a digital matte painting of an ice-laden Gotham City, as well as performing some rig and wire removal work on the film. The FOX Television Movie QUICKSILVER HIGHWAY provided FLASH FILM WORKS the opportunity to achieve a first in the realm of 3D animation. One segment of this Steven King/Clive Barker anthology required computer-generated hands to perform realistically as characters when separated from their host bodies. That was followed with work on UNDER WRAPS for the Disney channel, the HBO original production A BRIGHT SHINING LIE, and the Christian Slater/Cameron Diaz black comedy VERY BAD THINGS. For RUSSELL MULCAHY'S TALE OF THE MUMMY, FLASH FILM WORKS created 3-D mummy wrappings which unraveled and reformed into the mummy. 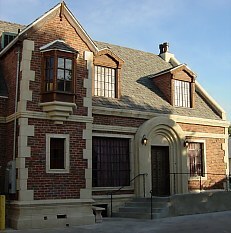 FLASH also worked on the Adam Sandler comedy THE WATERBOY during this time as well as creating a virtual underwater dream sequence for the Michelle Pfeiffer drama THE DEEP END OF THE OCEAN and a computer generated storm sequence for Renny Harlin's big budget killer shark flick, THE DEEP BLUE SEA. 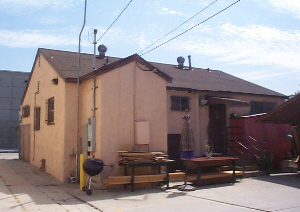 In the year 2000, FLASH FILM WORKS moved into their current offices on Seward Street in Hollywood. 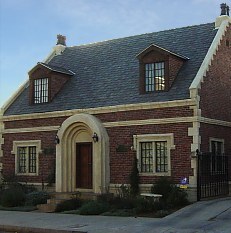 An old building was bought and re-designed by Production Designer Charles Wood in the style of the old English architecture. FLASH FILM WORKS won a series of advertising awards for work on a series of ONSTAR Television commercials featuring Batman, creating Gotham City cityscapes and numerous other effects, that also came in handy on the television pilot for BIRDS OF PREY. In the year 2001, FLASH FILM WORKS worked on the Eddie Murphy sci-fi film THE ADVENTURES OF PLUTO NASH, creating computer generated Moonscapes for the actors to walk through, and the Arnold Schwarzenegger action film COLLATERAL DAMAGE, where they were responsible for over 200 visual effects shots including creating CG Helicopters and debris, multiple rig and wire removal shots and several other types of shots as well. For the Andy Davis directed film, HOLES, based on the book by Louis Sachar, William Mesa was the visual effects supervisor as well as the Second Unit Director. For the film FLASH FILM WORKS created and animated 3D lizards, designed and composited the "God's Thumb" mountain range and added desert and holes to many shots as well as considerable additional work. 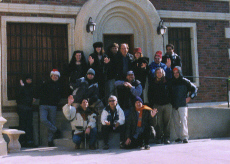 During this period, FLASH FILM WORKS also sponsored a 48 Hour Film Festival among its employees as a method of fostering creativity. We ran the festival twice before it spun off into the extreme filmmaker film festival and ran for several more years. FLASH FILM WORKS big project for 2003 was the Ed Zwick directed film, THE LAST SAMURAI, starring Tom Cruise. We performed around 200 effects shots on this film, including CG arrows, matte painting, compositing armies and face replacements. The work on this film earned us our first Visual Effects Society Award for "Best Supporting Visual Effects." 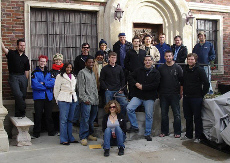 FLASH FILM WORKS in 2004 worked on two comedies for Revolution Studios. For the Wayans Brothers comedy "WHITE CHICKS" we did several green screen composites and a day-for-night sequence. On the Tommy Lee Jones cheerleader comedy, "MAN OF THE HOUSE" we did several crowd replacement shots during the climatic football game as well as a number of additional shots. FLASH FILM WORKS next assignments included the Disney Studios horror film "DARK WATER," a remake of the Japanese film of the same name, "INTO THE BLUE" starring Jessica Alba for MGM, Cameron Crowe's "ELIZABETHTOWN" starring Orlando Bloom and Kirsten Dusnt for Paramountm the basketball film "GLORY ROAD" for Disney and the pilot episode of the Jennifer Love Hewitt television series "THE GHOST WHISPERER" for CBS Television. FLASH FILM WORKS, in the year 2006 worked on he Andy Davis film, "THE GUARDIAN" starring Kevin Costner and Ashton Kutcher for Disney. This project involved extensive 3D animation of storms and waves. 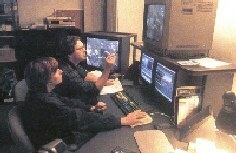 Flash Film Works used Real Flow software to assist in the creation of these extremely difficult sequences. Over the next several years, FLASH FILM WORKS worked on the Ed Zwick directed film, "BLOOD DIAMOND" starring Leonardo DiCaprio, the Sandra Bullock comedy "ALL ABOUT STEVE", the Ed Zwick World War II drama "DEFIANCE" and the Keanu Reeves/Jennifer Connelly sci fi film "DAY THE EARTH STOOD STILL" . Flash did several CG helicopter sequences, an interactive table top display and numerous other compositing shots. FLASH FILM WORKS provided several lengthy visual effects sequences for the 2010 HBO Mini-series "THE PACIFIC" . The extensive workon the Pacific won an Emmy Award for Best Visual Effects in a Mini-Series and Visual Effects Society awards for Outstanding Visual Effects in a Broadcast Program and Outstanding Compositing in a Broadcast Program. More recent projects include "BARELY LETHAL,""THE LIBRARIANS" and "SPY." These are from some of the early Visual Effects Society Awards shows, Flash Film Works produced short tribute videos to George Lucas and Robert Zemeckis, who were being honored by the VES.